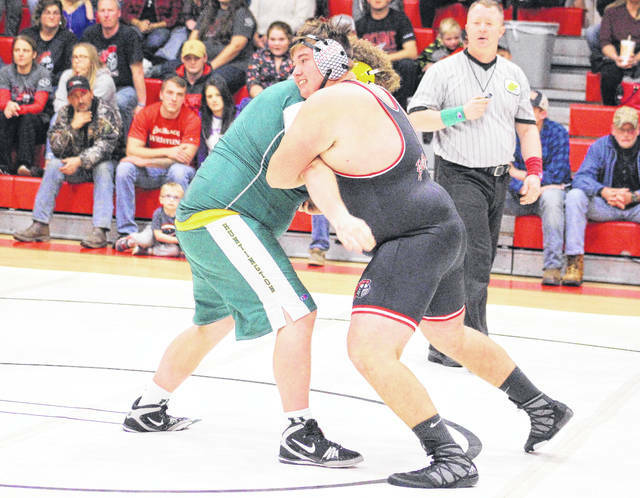 Point Pleasant sophomore Jacob Muncy maintains leverage on a Huntington opponent during a heavyweight bout against Huntington on Dec. 6, 2017, in Point Pleasant, W.Va.
JOHNSON CITY, Tenn. — It was worth the trip. The Point Pleasant wrestling team came away with runner-up honors this past Saturday at the 2018 Fandetti-Richardson Brawl held at Science Hill High School in the Volunteer State. The Big Blacks secured their second straight weekend with a second-place finish at the 18th annual event, which featured a total of 18 programs from nine different states. PPHS ended up with one divisional champion, a quartet of top-four efforts and a baker’s dozen-worth of top-seven finishes en route to a final tally of 182 points. Host Science Hill won the championship with 219 points, while Heritage (TN) was third with 174 points. North Henderson (NC) and Bradley Center (TN) rounded out the top-five with 165.5 and 141.5 points, respectively. The Red and Black finished the weekend competition with a collective record of 47-37 in individual competition, which included a 45-21 effort from the starting 14. Point freshman Christopher Smith was the lone weight class champion with a 4-0 mark at 106 pounds, while junior George Smith (120) and freshman Mitchell Freeman (126) both placed second with identical 4-1 records. Sophomore Logan Southall claimed fourth place at 160 pounds with a 3-2 mark as well. Isaac Short (113), Riley Oliver (132) and Jacob Muncy (285) all went 4-1 overall en route to fifth-place finishes, while Jake Roub (152) and Juan Marquez (195) were both sixth with matching efforts of 3-2. PPHS also had a quartet of grapplers place seventh overall in their respective weight classes. Zac Samson (145), Jacob Bryant (170) and Clayton Hill (182) all finished 3-2, while Dakota Moses was 2-2 at 220 pounds. Wyatt Wilson went 1-2 at 138 pounds. Tre Craddock (285) and Nazar Abbas (170) also picked up a single victory in their respective divisions. Point Pleasant returns to action this Friday and Saturday at the 2018 WSAZ Invitational being held at Big Sandy Superstore Arena in Huntington.